Harmony is the blending of complementary voices, notes or tones. It can also describe the “chemistry” between simpatico human beings. Montegrappa presents Armonia as the ideal “first pen’, the perfect gift for the graduate, the student, a new professional position or anyone embarking on another chapter in life’s journey. The price points are amazingly low. The value is obvious upon your first experience with the instrument. Its embellishments include a circumferential band around the lower section of the cap, which is engraved with the “Montegrappa” signature. The cap is also adorned with the brand’s 1912 symbol. Its pocket clip is sinuous, ending in the company’s rolling-ball that ensures smooth ingress and egress from a pocket. 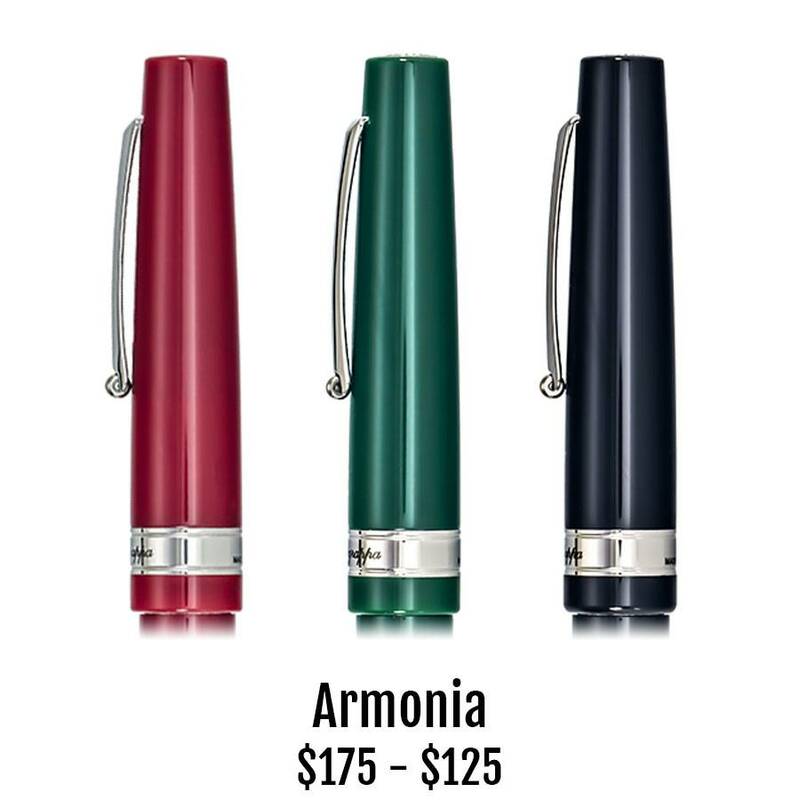 Armonia is designed for all writers and is available in fountain pen, rollerball and ballpoint. The fountain pen uses both converter and cartridge filling systems. Its stainless steel nib is enriched with a Greek fret etching. The ballpoint uses a Parker-Style which means there are several inks and dozens of colors from which to choose. The Armonia is a ‘must have’ for every collector.